I think this weekend I'll try to post a tutorial for this. 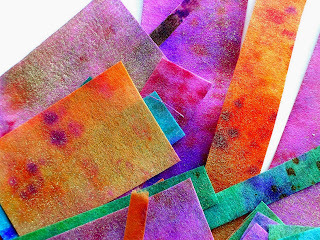 These are the scraps I have left after dyeing and using a full yard of stiff interfacing. They're so pretty that I need to make more. I'm noodling ideas for uses. They are yummy! I want to roll around on them. Sorry, that might sound kinda gross. Can't wait to see the tutorial cause they are very "PURTY".